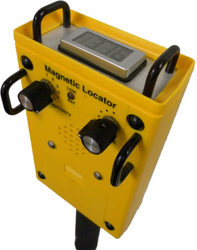 The DML2000-XRM is the world's most sensitive magnetic locator built right here in the USA! Sensitivity is double that of earlier models. It features an LCD output screen in addition to the audio output. This locator is known for performance and durability. Users relax in the knowledge that the proven shock-mounted sensor technology safeguards the sensor's mechanical integrity in the harshest of conditions.